What is a monster? Is it a scary being that lives in our imagination? Or, are monsters things that actually exist to challenge our perception of control? This story isn’t going to give you a definitive answer to that question. 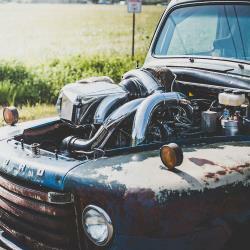 But it will tell you about a 1,200 horsepower diesel-powered monster that wouldn’t exist in our world, if it weren’t for the vivid imagination of a man named Scott Birdsall. Old Smokey F1 is a wolf in sheep's clothing. A true sleeper. Eventually, a newer 5.9L Cummins from a 2005 Freightliner medium duty semi truck found it’s way under the hood. This allowed Scott to tune the motor with a laptop, giving him a much broader range of performance options. 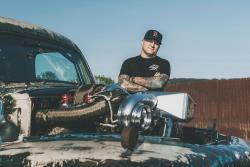 He explained: “To build this truck, I worked with companies like Industrial Injection, Garrett Turbochargers, and Bell Intercoolers, which taught me a lot about the fluid dynamics and other technical stuff.” In it’s current form, the truck now known as “Old Smokey”, boasts a compound turbo setup that uses an exhaust-driven 80mm Garrett GTX5008 turbocharger to feed a second [massive] 94mm GarrettGTX 5533 turbo, which then compounds the boost and sends the 106 psi air charge through a giant Bell intercooler before it reaches the heavily modified Cummins diesel engine. The result of all this boosted wizardry is 1,463 horsepower at the crankshaft and 1,233 horsepower/2,000 lb-ft at the rear wheels. 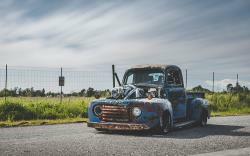 That’s right, this rusty old 1949 Ford F1 pickup has more power than any production Ferrari, Lamborghini, or Pagani. And it’s only a few ponies shy of the venerable Bugatti Veyron. But all Scott has to do is flip a switch to activate the 375-hp nitrous shot, and that fancy French car is toast. 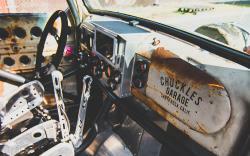 To handle all that power, a custom race car tube chassis hides beneath the truck’s patina'd bodywork. 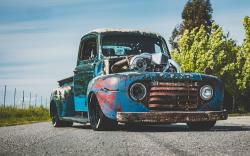 According to Scott, “There’s not much left from the original truck, except maybe the body and the dashboard.” But that’s okay, because this hot rod was purpose-built for land speed racing, road racing, and drifting. All Mr. Birdsall has to do is change the tires and adjust the suspension to suit the surface he’ll be on. 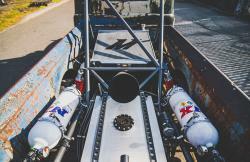 “The current speed record for a diesel truck is like 172 miles an hour, and we’re going to try an blow that out of the water.” To keep the Old Smokey Ford F1 on the ground at triple digit speeds, AIRAID helped Scott create a carbon fiber splitter, diffuser, and underbody panels. And a high-flow AIRAID performance air filter is used to feed a constant rush of clean air to those ginormous turbos. 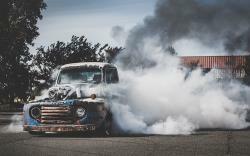 We at AIRAID are proud to sponsor Scott Birdsall and his Old Smokey Ford F1. 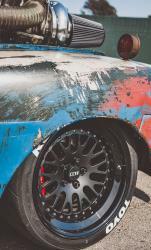 And we wish him the best of luck as attempts to break the diesel pickup land speed record with his rusty monster. The compound turbo set up on Old Smokey F1 pumps out over 1,200 horsepower!